OUR CROATIA EXPERT HIGHLIGHTS THE DESTINATIONS A FIRST-TIMER SHOULDN'T MISS, FROM HISTORIC SITES AND MEDIEVAL TOWNS TO SCENIC COASTS, DAY TRIPS AND THE BEST FESTIVALS IN CROATIA. The region you choose to visit will depend on what you’re looking for – a chill-out holiday on the beach with watersports as an option, a sailing holiday around the islands, an adventure-sports break with hiking, mountain-biking and rafting included, a foodie holiday with vineyard visits, or a cultural city break. If you’re visiting Croatia for one week, stick to one region and concentrate on what it has to offer. If you’re planning to be there for longer, you can combine two or more regions to get a better overview of the diverse landscapes and contrasting regional identities. Centring on the port city of Pula (1) (pulainfo.hr), noted for its first-century Roman amphitheatre, is a peninsula in north-west Croatia with close cultural and historic ties to Italy. Istria’s top seaside resorts lie along its west coast, and include Rovinj (tzgrovinj.hr), where Venetian-era pastel-coloured houses ring a picturesque fishing harbour, and Porec (to-Porecc.com, home to the 6th-century Unesco-listed Euphrasius Basilica, adorned with golden Byzantine mosaics. Close to Pula, the carefully manicured pine-scented islets of Brijuni National Park (2) (brijuni.hr), once Tito’s summer retreat, make a memorable day trip. Often forgotten, but well worth a detour from the coast, inland Istria is a haze of undulating vineyards and romantic medieval hill towns, such as Motovun (tz-motovun.hr) and Groznjan (tz-groznjan.hr), as well as the Mirna Valley, a top hunting ground for the regional delicacy, truffles. The Slow Food movement has a firm following in Istria, and many Italians drive over two borders specifically to eat here. The heart of this region is the port city of Rijeka (3) (tz-rijeka.hr), overlooking the sheltered Kvarner Gulf and backed by the mountains of Gorski Kotar. Close to Rijeka lies the sedate seaside resort of Opatija (opatija-tourism.hr), with several grand late-19th-century hotels once patronised by Austro-Hungarian aristocracy. From Opatija, the lovely seven-mile Lungomare (coastal footpath) runs to Lovran (tz-lovran.hr), home to elegant Secessionist villas set in lush gardens. From Rijeka there are ferries and catamarans to Cres, Losinj, Rab and Pag, where the most appealing destinations are Mali Losinj (tz-malilosinj.hr) and the medieval-walled Rab Town (tk/tzg-rab.hr). The island of Krk is joined to the mainland by a bridge and is home to Rijeka airport – its main resort, Baska (tz-baska.hr), on the south-east coast, overlooks a one-mile- long curving pebble beach. Back on the mainland, Croatia’s most visited inland destination is Plitvice National Park (np-plitvicka-jezera.hr) with its emerald-green lakes and thundering waterfalls. Plitivice can be comfortably visited as a day-trip from Rijeka, Zadar or Zagreb. The focal point of this region is Zadar (4) (tzzadar.hr), which contains a lovely old town and is home to several Romanesque churches plus the modern-day Sea Organ, built on a small car-free peninsula. Most of Zadar’s hotels lie outside the historic centre, along the coast at Puntamika and Borik. Near Zadar, Kornati National Park (kornati.hr) is an archipelago of uninhabited rocky islets, best explored by private sailing boat, but also accessible on an organised day-trip from the mainland. The long skinny arid island of Pag sprawls between two regions, North Dalmatia and Kvarner. It is noted for excellent roast lamb and Paski sir (a salty sheep’s cheese), as well as open-air clubbing and music festivals on Zrce beach in Novalja (tz-novalja.hr). Back on the mainland, hikers and climbers should head for the Velebit mountains, within North Velebit National Park (np-sjeverni-velebit.hr) and Paklenica National Park (paklenica.hr). The highlight here is Split (5) (visitsplit.com), the splendid Unesco-listed old town within the ancient Roman walls of Diocletian’s Palace. Most visitors to the region fly into Split, then take a ferry or catamaran to the islands of Brac, Hvar or Vis, where the most popular resorts are Hvar Town (tzhvar.hr) on Hvar, with the boho-chic seafood eateries that make it a favourite mooring base for sailors, and the family-friendly Bol (bol.hr) on Brac, where you’ll find the lovely Zlatni Rat beach plus excellent conditions for windsurfing. 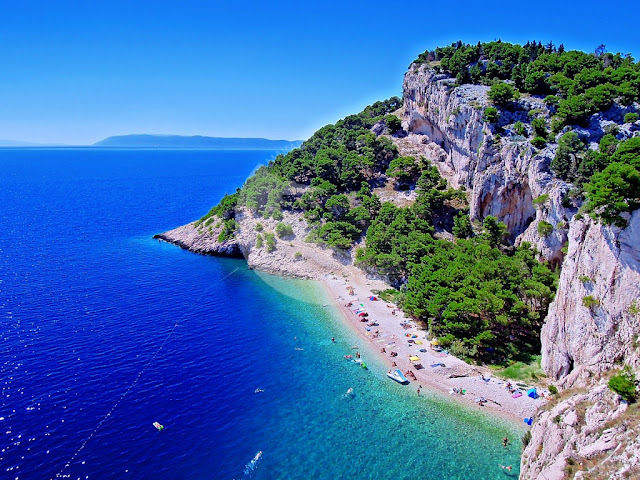 Back on the mainland, the Makarska Riviera, centring on Makarska (makarska-info.hr), offers blissful pebble beaches backed by the rugged Biokovo Mountain, ideal for hiking and mountain biking, while Omis (tz-omis.hr) is the starting point for rafting down the River Cetina. Other cultural attractions include Unesco-listed cathedrals in Trogir (tztrogir.hr) and Sibenik (sibenik-tourism.hr). Finally, Split is the main charter base for sailing holidays in Dalmatia. The star attraction in this region is Dubrovnik (6) (tzdubrovnik.hr), Croatia’s most popular and most expensive destination, with an amazing Unesco-listed fortified old town and the country’s highest concentration of five-star hotels. South of Dubrovnik lies the peaceful seaside resort of Cavtat (visit.cavtat-konavle.com), while from Dubrovnik’s Gruz port there are regular ferries to the tiny car-free Elaphiti islets of Kolocep, Lopud and Sipan. Dubrovnik also makes a convenient base for day-trips into neighbouring Montenegro and Bosnia-Herzegovina. Peljesac peninsula, which lies to the north up the coast, produces some of Croatia’s top wines, including the highly esteemed Dingac, and several vineyards offer tastings. At the land-end of Peljesac, many Croatians visit the tiny Ston (ston.hr) to eat its renowned oysters and mussels. Farther along the peninsula, the main resort is Orebic (visitorebic-croatia.hr), where you’ll find beaches, plus windsurfing in nearby Viganj. From Orebic, ferries go to the island of Korcula. Here the main attraction is Korcula Town (visitkorcula.eu), another lovely medieval-walled stone settlement, hosting evening performances of the moreska sword dance. While Peljesac produces outstanding red wines, Korcula is famed for its fragrant white wines, notably Posip and Grk. Close to Korcula but more easily reached by ferry from Dubrovnik, the island of Mljet is home to the impressive forests and salt-water lakes of Mljet National Park (np-mljet.hr). The Croatian capital is often unfairly overlooked. It has a romantic medieval old town, Gornji Grad, home to the parliament and the cathedral, and Austro-Hungarian buildings in Donji Grad, which include several excellent museums – and it can be reached year round on daily direct flights from London (seezagreb-touristinfo.hr). From Zagreb, it’s also possible to make a day trip to Varazdin, with its 18th-century Baroque architecture and an annual Baroque music festival. Throughout the summer there are open-air cultural festivals, the best known being the Dubrovnik Summer Festival (dubrovnik-festival.hr), staged from mid-July until mid-August and attracting well-known international performers, this year including the American jazz double-bassist and composer Colley Scott. Another much-loved event is the five-day Motovun Film Festival (motovunfilmfestival.com) in July, where the 2013 guest of honour is the British director and screenwriter Terence Davies. There are also plenty of contemporary music festivals. They include the Hideout Festival (hideoutfestival.com) on Zrce beach in Novalja on the island of Pag, where Four Tet will perform a DJ set in July; the alternative rock festival Terraneo (terraneofestival.com) in Sibenik in August, where this summer’s line-up includes the British Eighties dream-pop band My Bloody Valentine; and the Unknown Festival (unknowncroatia.com) in Rovinj in September, which will welcome the London-based Django Django.